A few months ago, I had the privilege of participating in a traditional Japanese tea ceremony. It was a unique opportunity to gain new perspectives and an understanding of diverse cultures, but I must say, I particularly enjoyed the moment of quietude. It was here that I had my first sip (and slurps) of matcha tea. Like all teas, excluding herbal teas, matcha comes from the Camellia sinensis plant. What's unique about this green tea is that the plant is kept in the shade about three weeks before harvesting so that certain nutrients are produced to create a sweeter taste. After picking, it's steamed, air-dried and ground into a bright green powder. Because the entire leaf is dissolved in water, versus steeping the leaves like conventional tea, matcha is known to have three times as much disease-fighting antioxidants. Matcha tea is a particularly rich source of L-theanine, an amino acid unique to tea and known to have a calming effect. While it does contain some caffeine, it contains at least one-third less than a cup of regular black coffee. 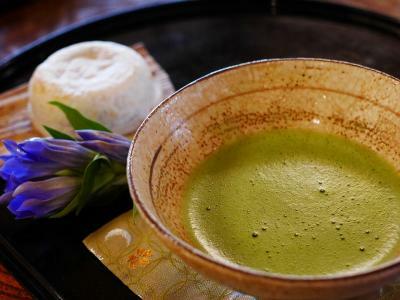 As the popularity of matcha grows, production in areas other than Japan are producing matcha to meet global demand. However, they may not follow the traditional production methods, which could hinder quality and purity. Read the package label to look for the product origin and if it has added ingredients. Matcha is delicate in that it doesn't like heat, light or too much oxygen. Store matcha tea in an airtight container in a dark cool place to preserve it's flavor, freshness and nutritional quality. Making matcha tea is as easy as mixing the powder with hot water. In tea ceremonies, matcha is whisked with a bamboo whisk in a tea bowl, but a simple whisk or spoon in a mug will work just fine. Experiment with matcha powder in a variety of ways, such as in smoothies, cookies or oatmeal. Bring a calming factor to life's own stresses, and drink matcha tea. Place all ingredients in a blender and blend until matcha is dissolved (or place ingredients in a glass and whisk until matcha is dissolved.) Pour into a glass over ice.